My Life Changing Experience of Human / Animal 2-way Telepathy (TelEMPATHY) - If all were to learn this, would the Earth be rapidly healed? This is easily one of the most important topics to understand on Earth at present. The needless suffering being caused to billions of lifeforms on this planet out of ignorance, arrogance and unconsciousness is beyond measure. Several years ago I came across a life changing documentary about an animal communicator called Anna Breytenbach, who is hired regularly by zoos and animals reserves to talk without words to the animals in a way which few have any understanding of at present. Not long after that I found that I too could experience such communication and now have a strong urge to help others discover their lost ability to communicate too. We do not need to be 'special' in any way to do this, we simply need to know how to do it and importantly, to accept that it is possible and be open to it working for us. The consciousness that expresses through the form of the animals on earth is to all intents and purposes, the same consciousness that expresses through humans - the animals are literally our family and definitely not food! The topic of how exactly the life forms on earth came to start eating each other unnecessarily is a very interesting and very long winded topic to explore however - so I will leave that for another day. First, some intense demonstrations of real life animal / human telepathy. I have long understood that the heart and the emotions are the way to higher consciousness. They connect our thoughts to everything that exists using the magnetic carrier mechanisms provided by the feminine component of 'all that is'. In other words, our feelings connect to the part of us that can feel very, very deeply indeed - way beyond our present location and perhaps on into infinity. However, every time we mentally ignore and deny a real emotion we literally DEADEN our ability to feel in the future and limit our ability for empathy, telepathy and deep understanding. I have focused on healing my heart and other related aspects for 10+ years and so by now I know a lot and have experienced a lot that most have no idea about with regards these subjects. I have long understood that I am one with the animals - literally and that is a big part of why I choose to be vegan and to not participate in the exploitation of the animals at all. As Anna states clearly in the videos above, we have probably all had some type of experience of animal/human telepathy - it is just that we are not conscious enough that this is occurring for us to truly understand the reality of the situation. However, once I realised that I am intended to be able to fully communicate with non human creatures I made sure to test and explore the idea. It was not long before I had a good opportunity. 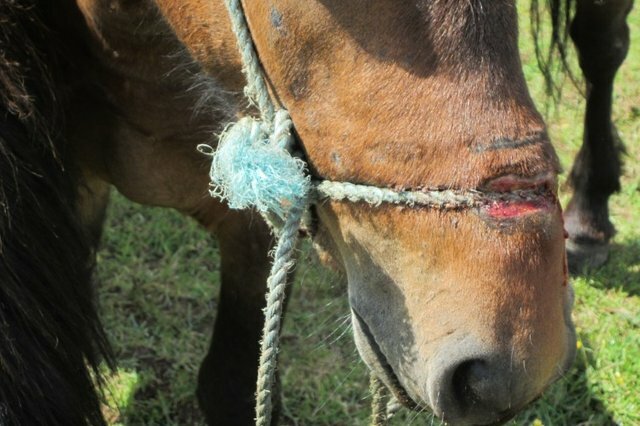 Nearby to my previous home there were some horses that were kept chained up in a field 24 hours a day by gypsies. They were effectively held their to be used for breeding and not much else - so they were not happy. They were like empty shells in fact, just stuck in the same part of a field forever until death. One day I saw a man kicking and punching a horse and was shocked - I wasn't sure what to do since, in my experience, starting arguments with families of gypsies is not generally advisable. I couldn't go and cut the horse free myself because I had nowhere to take it to and the horse would have just wandered around the town. I decided to do what little I could, which was to contact the animal protection services - however, unfortunately, they did nothing but come and put a tracking chip in the horses! Anyway, once I had an opportunity to, I approach some of the horses and bonded peacefully with one of them as Anna does. I asked the horse in my heart "What do you want/need?" and I heard inwardly as a vibration that was actually translated in my brain as my own inner voice (without me instigating it) - that the horse wanted/needed to be with the other horses over the other side of the forest nearby. I was a bit confused by that because I didn't know there were any more horses nearby, but I set off in the direction I had been pointed towards and sure enough, after only 10 minutes walk I came across a field with immaculately kept and cared for horses - which, understandably, the chained horses wanted to live with. A few years later, I had relocated to a more countryside location and was walking in some fields near my new home. 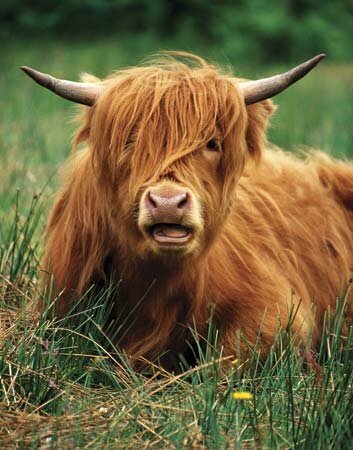 I had previously seen a group of long haired highland cows in the fields there - but this time they were absent. As I stood, observing the view, I noticed I was receiving a message just as I had done previously with the horse. I looked around but couldn't see any animals anywhere. I intuited that the message was letting me know that someone was lost and wanted to go home. After a couple of minutes I found the speaker! A cow had got separated from the rest of it's herd and was in a field on it's own. I tuned in more specifically to that cow and had a further, brief communication. Again though, I was not able to help the cow because I had no idea where the others were or how to bring them together - but at least in this case I am pretty sure the cow was OK, since the cows there are moved around regularly. Sadly, though that whole period of my life I was helping my ageing parents with serious illnesses and healing myself of issues following a car crash too - so I simply didn't have the energy to follow up this part of my life in much depth. Now though, I have more time available and definitely intend to increase my experience of and receptivity to animal voices. I'm sure that anyone who takes the time to truly watch and FEEL the videos above will feel similarly - I urge you not to allow longstanding mental programming and/or addiction to the taste sensation of eating dead animals to get in the way of your own evolution and participation in the healing of Earth. "The topic of how exactly the life forms on earth came to start eating each other unnecessarily is a very interesting and very long winded topic to explore". This is something I've always wondered, too. When did all this madness start? I can't answer that with 100% certainty, but one of the most promising (and radical) sources for answering that (and answering just about every other question) is here. Great, thanks - I appreciate you sharing your kind words. What i do believe is that animals have feelings , wants to beloved too. It is up to us people if we will make them wild or tamed. How do you take this post @Frost04? my old St. Bernard would intuit people's intention's from about 100 yards. If a person had ill intentions my boy would let me know asap. Animals are expressions of life just like us and our plant friends. All the gardeners I've met say the same thing, the things that make us happy are our plants and animals. well, we humans have the capacity to inspire joy too - we just need to become more human and less robotic! I was thinking yesterday about plans for steem communities outside of any territiorial boundaries. That is considering what may happen to crypto's with governments getting more desperate. We could do some amazing things with steemit and other crypto communities, maybe like collecting the materials in the various gyres into floating islands where we could live and help clean up the planet a bit. Or garden communities focusing on creating food. I think in the near future (as people get to know each other more through steemit etc. ), there will be more human interaction as we put these plans into action. It is important to realise that we don't actually need 'money' to bring about the called for changes - we just need to stop allowing ourselves to be limited by the control system that money has become and instead learn to share resources and unify in intent to achieve the greatness we require. steemit though, does facilitate the real magic in that it does bring people together, albeit in many cases motivated by the desire for money! Yes well put, I'm just really digging all the people here looking for ways to pursue their dreams and goals. Wow, this is remarkable. This is another aspect of man's incredible abilities that we've lost. Modern human treats animals like inanimate objects that's not capable of sadness or depression. How we eat meat in lunch and dinner without much regard how it was made or the animals that was slaughtered to satisfy our appetite. I am in no means a vegan nor advocating for one but I hope people who do business that is related to animal husbandry or any kind of business that deals with animals would see this message of yours and maybe, just maybe they take this to heart and good things will happen. Thank you for this wonderful read sir. I agree to you and especially OP's post. The world needs more like minded people. Cheers! You are welcome. I truth, this is a journey of self awareness and enlightenment - since, the more we understand about reality, the less we can continue to agree to overpower and abuse other beings. What a beautiful gift. I believe we all have it but few open themselves to communicate and listen. I know my hens and pups understand me. When someone dear to me passed I was gardening and quietly lost in thought and when I turned around the flock was all there quietly standing, in a way mourning and offering their sweet condolences. It was then I cried and my pups came to me. Even when doing mundane things and I say something to them I know when they think its funny or they are in trouble haha. My fish in my pond too. Thank you so much for sharing your story! That same video of Anna also first turned me on to these ideas a couple years ago. Then last year when we were having some behavior issues with one of our pet pigs, we thought to reach out to an animal communicator. It was a great session and it opened our mind to new possibility and how to help channel Matilda's energy in a positive way. Our pet pigs turned me and my fiance into vegetarians and we got to share that message with them. They helped us to be a voice for all animals. All the best and thank you again for sharing. So glad to be following you on here. Onward and upward! This post received a 1.9% upvote from @randowhale thanks to @ura-soul! For more information, click here! Really appreciate this post.. I feel a very strong connection with animals, yet I am still struggling with my addiction to meat. I have definitely communicated with animals here in the Rockies, and certainly with my bird in Pennsylvania. We miss each other dearly and I can feel her here. Thanks for sharing here. The desire to eat dead animals is definitely an addiction as far I am concerned too. I ate 'meat' for nearly 30 years before I stopped.. I had become almost totally unconscious of what I was eating - denial. It was partially through watching videos of slaughter houses and also partially through realising I needed to improve my diet to meet my body's needs that I eventually learned to do a cleanse, which made the transition to a plant based diet pretty simple. Have you already posted an article regarding cleansing? If so I would love to read more. I have been slowly increasing the percentage of plants vs animal products, but have yet been able to totally kick the stuff. However, there have been strings of days when my diet was completely plant-based and during those days I noticed an extreme increase in happiness and clarity. I have posted about fasting, which is very much also a process of cleansing too, but there is definitely room for a post specifically just on detoxing/cleansing.